In this solo cooking adventure, Gary goes the lazy route and makes a sandwich instead of pasta. In what may be the single laziest post I’ll ever write on this site, I present to you words and photos of a sandwich-making experience. I actually didn’t set out to make a sandwich but it was a hot, summer night and I just didn’t feel like standing over a hot stove for an extended amount of time. The plan was to make pasta with a sauce consisting of prosciutto, peas, tomatoes, and basil. Instead, I nixed the peas, bought some mozzarella and ciabatta and, voila, sandwich ingredients! As you can tell from the above photo of the ingredients, the ciabatta was split and then toasted. Instead of using a toaster oven which would have toasted the entirety of the bread, I chose to toast only the insides on a really hot surface (i.e. a pan). Some olive oil and salt before it hit the ripping hot pan, wait a few minutes for it to toast up, and then drizzle some balsamic vinegar onto it. 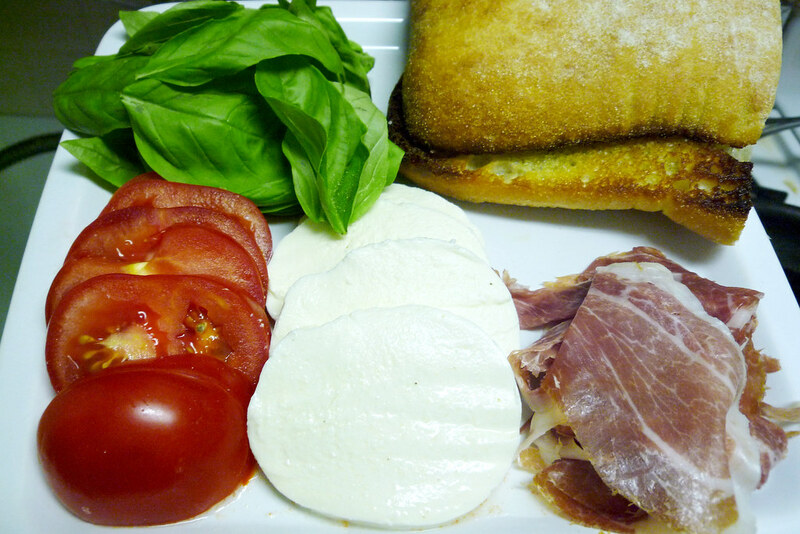 After that, it’s just a matter of how you want to layer the prosciutto, mozzarella, tomatoes, and basil. Here, I layered the on the top and bottom, choosing to put the rest between the layers of basil. I learned from this occasion and, in subsequent attempts, layered the mozzarella on the top and bottom so it could melt a little more, keeping the sandwich intact. Still, despite my best efforts of messing up the order of layers, the sandwich looks good, no? 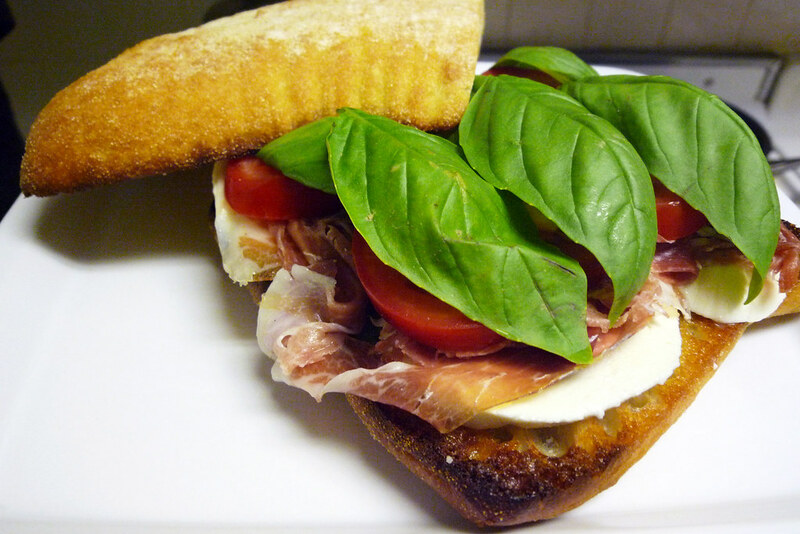 Constructed while the bread is hot, its enough to wilt the basil but not cook it, slightly melt the mozzarella, and, best of all, gets the prosciutto fat to melt a little, creating a nice, fatty coating. And, of course, it tastes great no matter how you construct it. Slice the ciabbata loaf in half. Brush each half with olive oil and sprinkle salt, to taste. On a hot surface (pan or griddle), toast each half of the loaf on the oiled side until browned. Remove ciabbata and drizzle balsamic vinegar on each half. 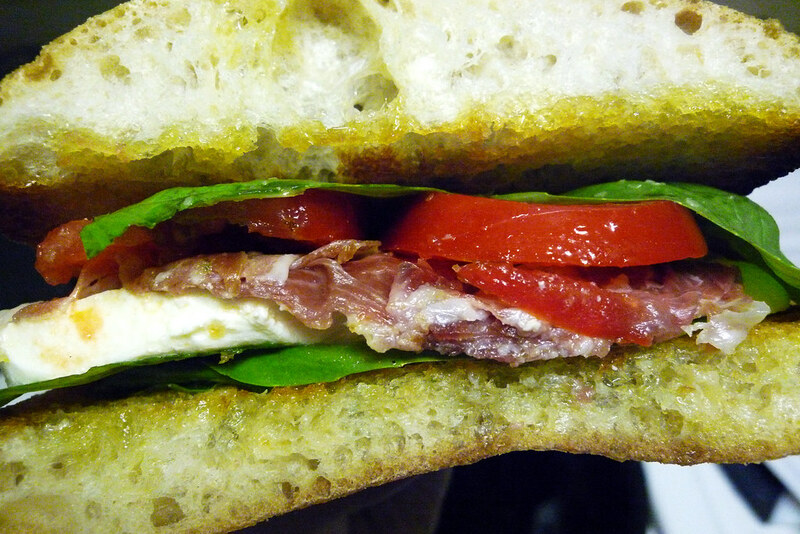 Layer the prosciutto, mozzarella, tomatoes, and basil onto the bottom half of the ciabbata. Add black pepper, to taste. Put the top half onto the sandwich and apply a little pressure to slightly melt the mozzarella.